Rugby Town beat Romulus 3-0 on Saturday and boosted their survival chances, helped by the fact both their relegation rivals lost their games. Now 20th out of the 22 teams, Rugby went ahead just before half time at 17th-placed Romulus with a goal from David Kolodynski. Ryan Quinn made it 2-0 on the hour and Kolodynski made sure of the points, scoring his second with five minutes to go. 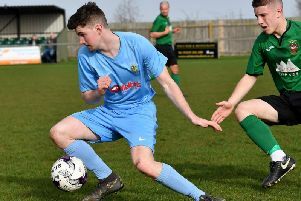 Elsewhere in NPL Division One South, bottom club Northwich Victoria went down 4-1 at home to Rushden & Diamonds while Loughborough Dynamo lost 4-2 at Stockbridge Park Steels. Valley now have 23 points from 34 games, Loughborough 22 from 34 and Northwich 19 from 33 games. Rugby now face back-to-back fixtures - away and then home - against promotion-chasing Witton Albion. At the other end of the table Shaw Lane lead on 77 points from 31 games, Witton are second with 68 from 39 games while Spalding are third on 62 from 33 games.